Someone undergoing gender re-assignment will eventually tell all his/her relatives and friends about the change. It comes with the territory. This is not necessarily so for the crossdresser who lives part time as one gender, part time as the other. The crossdresser has options. In this series Linda Jensen is interviewing three crossdressers who have taken very different paths to ‘self-outing.’ This week she talks with Lucille who after 30 years of crossdressing has yet to tell anyone in her other life anything about Lucille, not even her wife or children. Linda is curious as to how she is able to do it. “I’m glad her wife let her get away to join us.” I tossed out the line hoping to learn a bit more about our expected companion. The ladies on the links. Naturally with my series about CD self-disclosures in mind I was eager to talk to Lucille about how she keeps her femme life so secret, even from her family. However that would have to wait. It turned out that despite her being from New York and me from Canada we had a lot in common. When you play golf in the NYC area, even on an early fall weekday afternoon you have a lot of time to wait and to chat, and to wait and chat some more. “When I discovered Transvestian and that it was possible to indulge my secret desire I fumbled about for several months but couldn’t get the makeup right,” Lucille continued, not bothering to acknowledge my interruption, “I didn’t have the feel or touch for the correct application and subtleties involved. We had to interrupt our conversation to play the second hole but soon could pause for more reflection at the third tee. “So how did Muriel help you?” I asked Lucille. “She taught me how to apply makeup and even gave me a “color the numbers” chart to remember. It was the first time I was dressed from the skin out, completely as a woman and with full makeup. What a thrill! “As I stood there, beaming as a complete woman she asked me my name. I had not thought that far forward and had no clue. ‘What do I look like I asked?’ She said, to me you look like a Lucille. I didn’t care for it at first but when your mother gives you a name, that’s your name. That’s still me, Lucille. “She was talking generalities to me and said that’s how you should look, nice. Not like a whore! I was taken back because at that stage we all want to look like brazen whores. “And now on the tee, from Long Island New York, Lucille Spencer,” I interjected as surprisingly it had come to be our turn to play the third hole. Lucille’s reminiscences had taken me back a long way, back to when I was a reader of Transvestian and then one of their contributing writers, to a time when I went to one of Muriel’s parties. Then I wondered if Lucille had been at the same party. Just before Lucille teed off she turned to Jan and me and said, “Muriel was a wonderful person and I still think about her today.” Amen to that. We all should be so lucky as to have a ‘mother’ like Muriel to guide us in our transformations. We played the next holes talking about this and that and waiting a lot at every tee. There must have been some really slow players somewhere up ahead of us as it was close to six hours before we finished and were able to make our way to the clubhouse lounge for a drink and a meal. I’m glad Lucille had decided to stay as there was something big I wanted to ask her. After putting our clubs away, changing our golf shoes for street wear — I chose an opened toed sandal with a one inch heel as I wanted to show off my freshly painted toe nails and I loved the way even the low heel helped project my tush and shape my legs. We found all three of us together in the ladies’ locker room, refreshing our make-up and brushing our hair. And of course we needed to pee, too. But I digress. 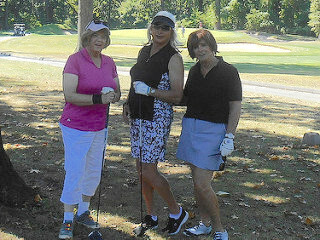 As I looked at Jan and Lucille I thought that we made a nice looking trio of senior (or near senior) ladies out for a game of golf and about to share drinks and a meal together. I knew Jan’s story and of course I knew mine but what about Lucille. How had she been able to carve out a Lucille life for herself for what seems like the last 30 years or so without her wife and the rest of the family knowing or even suspecting about Lucille? “I am what I am and that’s what I am,” I interjected in my best Popeye impersonation. “So your girls’ nights out were combined with business trips? Been there,” I said thinking of the times I would head to meetings in Toronto, Montreal or Vancouver with an extra suitcase. “No it wasn’t exactly like that. I never combined business with pleasure. Even in business I rarely ever spent the night away and most always went home. I like being home. I don’t like being alone in a motel room, even in a nightie. If I had a meeting I said I had a meeting. If I was going “out” I said I had a meeting. The logistics of doing both was too much. Jan and I laughed but Lucille looked serious. I guessed that she was not completely happy living that double-life with her family. I was tempted to ask Lucille about her field of work but I remembered Rule #3 of the Crossdressers’ Code and refrained. “You know my routine with my pied a terre so I get pretty well cleaned up and NOTHING ever comes home with me. Perfume doesn’t stay on me long and she’s not a good sniffer so I don’t worry about that anymore,” she added. “Make hay when the sun shines,” I commented. With that we changed the subject and soon were settling up the bill and saying our good-byes. So that is how Lucille makes her secret life work for her. Next time I’m going to tell you about a girl, a crossdresser, if you will, who lives her life totally open. One day you might be seeing her as a pretty lady; the next a rugged man.